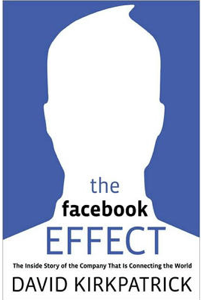 I’ve read David Kirkpatrick’s The Facebook Effect twice now. I’ve also interviewed him about the book twice on stage – once at TechCrunch Disrupt and a second time this evening at the Commonwealth Club in San Francisco. On a side note, as far as I know Kirkpatrick’s publisher Simon & Schuster is still planning on suing us for copyright infringement. I never heard back from them after their initial legal volley. I’m not holding that against Kirkpatrick, though – he’s a long time friend. So I’ve spent a lot of time with this book. And I’ve spent a lot of time covering Facebook over the last five years, since my first post in 2005 when the company told us that 85% of college students at covered schools were logging into the site at least once a week. About two years ago Kirkpatrick decided to write a book about Facebook. At the time the site was growing extremely quickly but it certainly wasn’t clear that it would become the 800 lb cultural gorilla that it is today. But he walked away from his position as one of the most senior tech writers at Fortune to pursue this book. And the end result is a fascinating read. Here’s my recommendation: If you are interested in startups, or how marketing and advertising are evolving, or just how Facebook is changing the world, buy this book. It’s very readable and gives great insights into how Facebook grew from a dorm room to a huge company. There’s no other book out there that gives such a complete history of the company and of Mark Zuckerberg. But if you’re looking for an objective and true history of Facebook, this isn’t it. 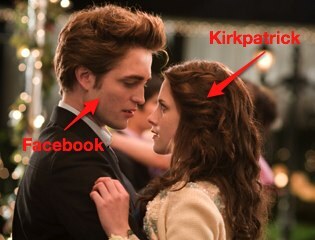 Kirkpatrick really, really loves Facebook. So much so that I’m not sure he’s even close to capable of being objective about the company. He’s Bella staring at Edward, the vampire, with those puppy dog eyes full of deep, meaningful, painful adoration. Edward/Facebook is awesomeness in a bottle. The result is a book that not only celebrates Facebook’s truly amazing accomplishments, but it’s also a book that makes excuses for, or denies, Facebook’s stumbles along the way. And that’s fine. But it isn’t really the truth. And what we need, eventually, is a book that tells the absolute, brutal truth about Facebook. I mean, historically speaking all this may certainly end up being true, and more. But it just seems a little early to be talking about Facebook in these terms. In our conversation this evening Kirkpatrick also compared Zuckerberg to Bill Gates, noting how both have a strong desire to mold the world to their vision. That may also eventually be true, but we need to let a little time go by before we put Zuckerberg in the same category as Bill Gates or Steve Jobs. I’d forgive Kirkpatrick’s love affair with the company if he was a little more circumspect and careful with the historical facts. The two famous lawsuits that fell out of Facebook’s early days – ConnectU and houseSYSTEM – were characterized more as nuisance lawsuits than real questions about the integrity of Facebook founder Mark Zuckerberg. We don’t need Kirkpatrick to shy away from the ugly details about the early days of Facebook. Sausage making is never pretty. But he gives such a one-sided view of the story that it leaves me wondering what details are being left out. And plenty of details are left out, apparently. Kirkpatrick says he never actually spoke with the Aaron Greenspan, or the Winkelvoss brothers, or any of the other people who sued Facebook and Zuckerberg. Instead Kirkpatrick relied on the legal documents filed in those cases for their side of the story. That’s just not a good way to get to the truth. That’s a great conclusion, but Kirkpatrick should have interviewed all of those people, and told the story from their perspective as well as Facebook’s. I think most readers are intelligent enough to look at both sides of the story and draw the right conclusions. Perhaps even the same conclusions that Kirkpatrick came to without even interviewing the people involved. They say that history is written by the victors. In the end The Facebook Effect reads more like an authorized biography than anything else. It’s the story of Facebook as Facebook wants the story told. It is a wonderful, if flawed, story about the creation of a company that half a billion people interact with regularly. I highly recommend you read it, and then wait for the book that will tell the whole story. You can buy The Facebook Effect: The Inside Story of the Company That Is Connecting the World at Amazon here.